My Traeger Baked Peach Crisp Cake is sure to wow your taste buds with browned butter yellow cake layers, smoked peach compote, cinnamon crumble and vanilla bean buttercream. It’s the first weekend of our summer vacation and I’m excited to be spending the day at the Gygi Grilling Gala in Salt Lake. The Grilling Gala is a free, annual event Orson Gygi (home to my cake classes) puts on for the community. This full-day event features chefs and BBQ pit masters teaching free grilling and smoking classes to the local community. This year, Gygi asked me to join in on the fun and challenged me to come up a cake we could grill! Not one to turn down a challenge, I jumped on the opportunity to get out of my comfort zone and try something new. Up until now, I’ve never baked a cake in anything but a traditional oven. I’ve also never grilled or smoked anything other than meat and vegetables. Time to switch things up! The timing also couldn’t have been more perfect. Just a couple weeks ago I attended an event at the Traeger Grills headquarters and learned just how easy it is to bake everything from cookies, to pies, and even cakes on a Traeger. With a little more knowledge under my belt, I got started on planning out my cake for the gala. 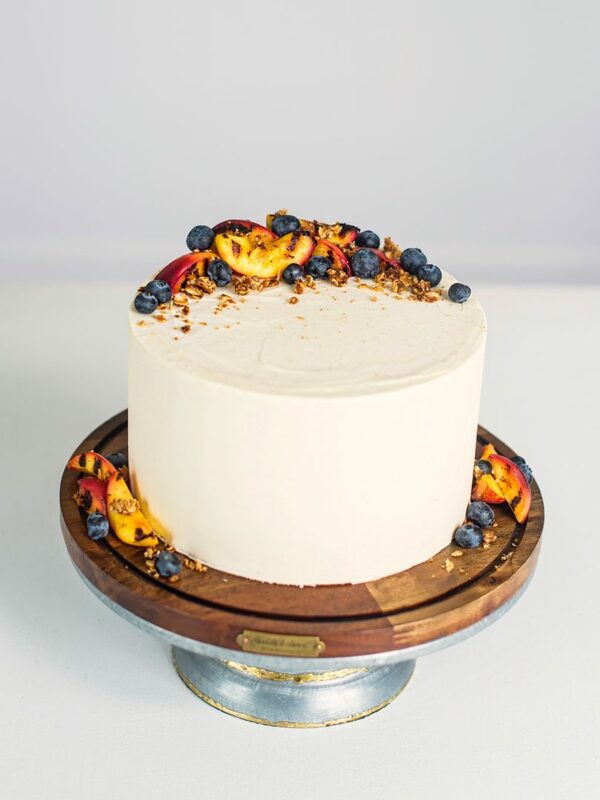 As I thought about what kind of cake I wanted to demo for the Grilling Gala, I originally thought I wanted to make something totally new. But, the more I thought about it, the more I kept thinking about my Peach Crisp Cake. It’s not only one of my favorite cakes, it’s also the one cake that reminds me of every camping trip I ever went on. I swear we always had a peach crisp baking in the dutch oven over the camp fire. 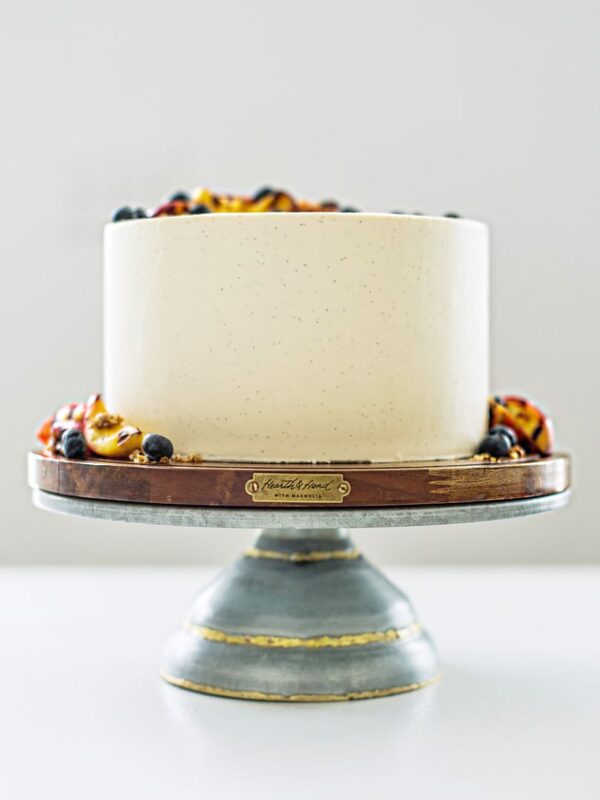 To change things up a little from my original recipe, I wanted to give the cake a real smoky flavor. Don’t worry, I didn’t take away all the sweet. I just wanted to tone it down a little for this one. Before making the cake batter, I decided to brown the butter over the stove. 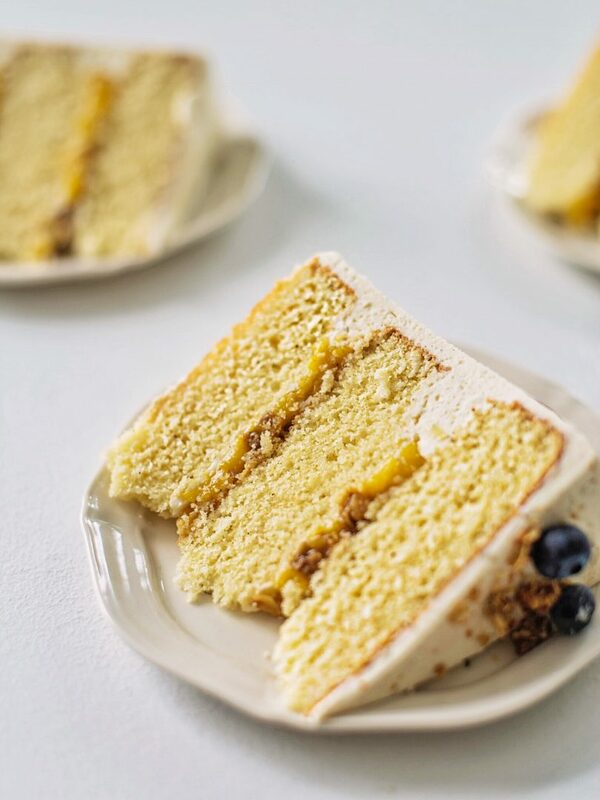 Doing this gives the cake a bit of a nutty flavor. I then baked the cake layers on the Traeger with a bag of mixed pellets and oh, my, goodness! The flavor of this cake is outstanding! I then smoked the peaches on the Traeger as well, but left the frosting and cinnamon oat crumble the same as the original recipe. 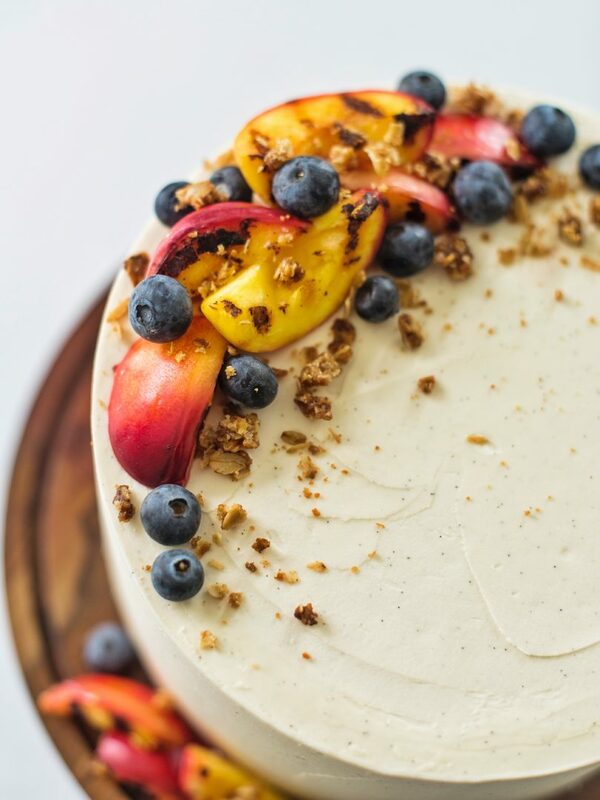 I love how the slightly savory cake and smoky peaches compliment the sweet buttercream and crumble. It’s a match-made in heaven! 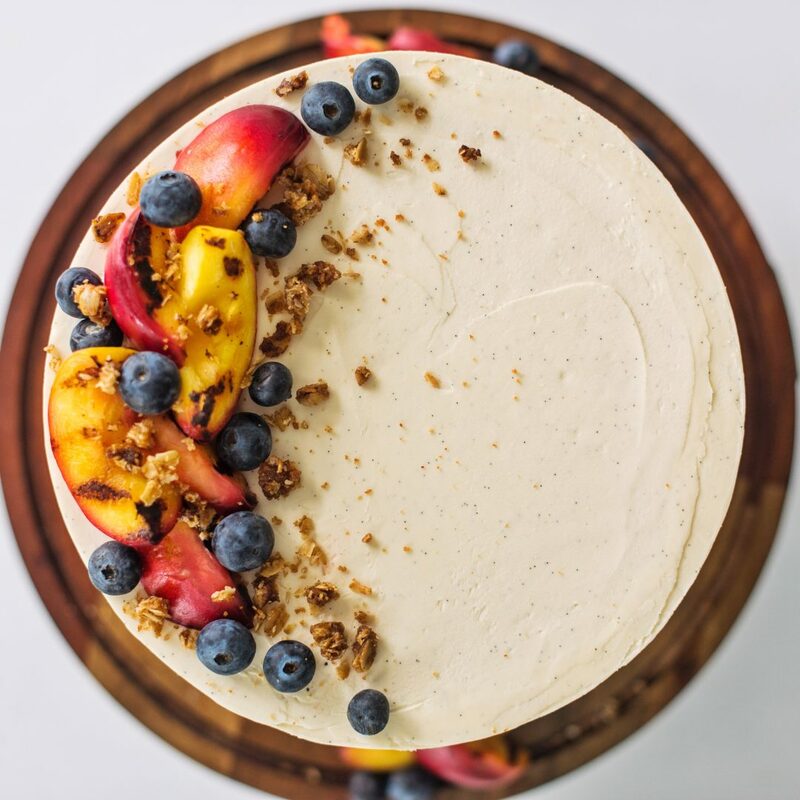 If you’re up for trying something new and are looking for the perfect summer BBQ dessert, this Traeger Baked Peach Crisp Cake is for you! Combine the chopped peaches, sugar and sifted cornstarch in a cast iron pan. 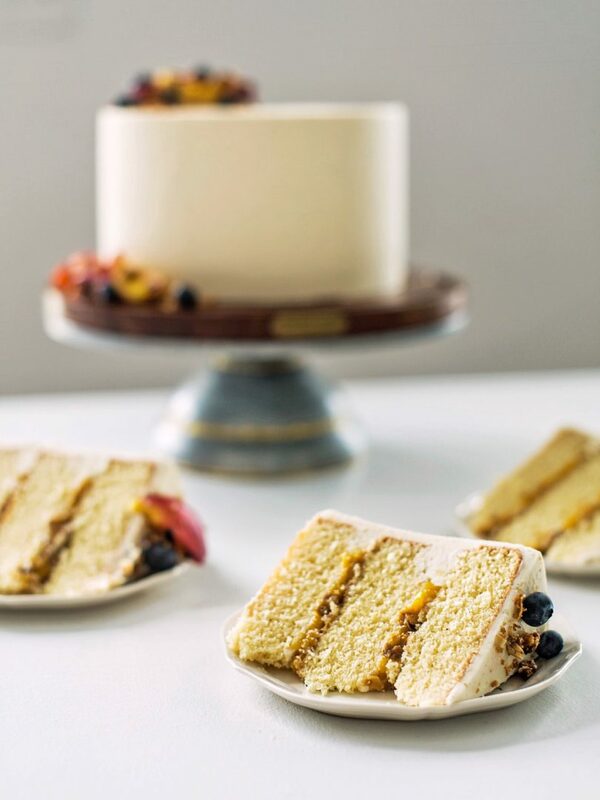 Set aside until you cook the cake layers in the Traeger. You'll then smoke the peach mixture while you bake the cakes. Preheat your Traeger Grill to 350 degrees F. Spray three 8-inch pans with non-stick spray, line the bottoms with parchment paper and spray again. Set aside. In a medium sized saucepan, brown the butter over medium heat on your stove. You want the butter to boil and start to pop. At this point, the butter will also start to cook. Keep a close eye on it and let it cook until it's browned and has some dark specs. Remove from heat and let cool back to room temperature. I suggest putting the butter in a bowl and refrigerating it so it can harden slightly, or making the browned butter a day ahead. In the bowl of a stand mixer fitted with a paddle attachment, combine the cooled butter, oil, sugar and salt. Beat on medium speed for about 2 minutes, until light and fluffy. With the mixer on low, alternately add the flour and baking powder with the buttermilk, starting and ending with the flour. Mix until combined. Add the butter extract and vanilla extract. Mix on low until combined. Bake the cakes on the Traeger for about 23 to 25 minutes, until a toothpick inserted in the center of the cakes comes out with only just a few crumbs on it. At this point, you'll also want to put the peaches on the Traeger as well. The peaches will cook for about 40 to 45 minutes. Let the peaches cool completely before using in the cake. Save remaining crumble and compote to serve on the side of each cake slice. Hello Courtney! I am saving up for a grill but, in the meantime can this be baked in the oven? I know it won’t have the same smoky flavor, etc. Yes! I would actually make the original peach crisp recipe on my site if you’re not using a grill.